Quality Printing and a Whole Lot More Since 1984! It's FILM FESTIVAL SEASON! Do you need SAME DAY PRINTING for your Movie Poster or Postcards? Short run poster jobs and short run postcards in the store with press ready files by 10 a.m. can be completed the SAME DAY! Digital Printing in Los Angeles. SLB offers digital printing in addition to offset printing and large format printing. When you need digital printing in Los Angeles, consider calling SLB Printing now. Our digital, VDP enabled, printing presses are capable of producing same day print jobs for everything from full color look books to black and white copies. We have multiple digital presses in the shop. All are capable of handling a wide range of high quality printing needs FAST with in-line finishing options. When you need cheap on demand printing for a short run of digital prints, booklets, brochures, proposals, pitch books, business forms, calendars, catalogs, comic books, flyers, pamphlets, postcards, or variable data cards and a whole lot more, digital is the way to go! Once your print job is completed, SLB Printing has off line finishing options for your digital prints too. Spiral bound look books, saddle stitched magazines and die scored tri-folded brochures are just a few of the bindery options available. Our trained bindery staff will deliver the best product with a quick turnaround. In most situations we can offer same day printing or 24 hour printing on the short run jobs we run on our digital presses. Now you know why SLB Printing is the place to call when you need digital printing in Los Angeles. Don’t forget to check out our letter shop and direct mailing services too. What is Digital Printing in Los Angeles? Digital printing is a method of using lasers and toner based, high-end, copiers that are capable of printing on a wide range of digitally approved substrates. Our digital presses can print on most paper stocks as light as 20# bond up to 17 pt card stock. We stock a large selection of papers that we have tested in order to achieve a high level of consistency and vibrant colors. Sheet sizes start at 5″ x 7″ and go up to 13″ x 19″. The press uses a RIP device (Raster Image Processor), that takes your press ready file and converts it into digital prints. Color matching software and RGB to CMYK conversion software do wonders with most jobs. For the most accurate prints, you should always convert your files to CMYK before submitting files to us. You can use RGB files but should always have a sample proof made in order to be sure that any color shifts are acceptable. Our staff is well trained at color correction techniques. So if the color is still not what you were expecting, with a little time and a few extra test prints, we can usually get very close to the color you were looking for as long as your color is within the gamut of the machine. Our machines are calibrated regularly to manufactures standards and we have been known to color correct and adjust files to perfect color. We’ve even been told that other print shops, with the same equipment, struggle with color. 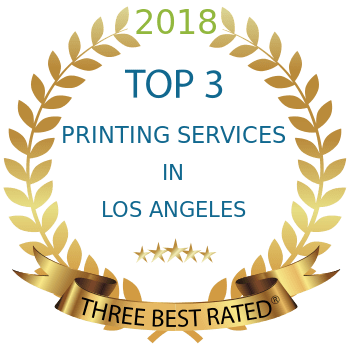 Constant color training and our desire to meet our clients high quality standards is what makes SLB Printing stand out in the competitive same day print world when it comes to digital printing in Los Angeles. Digital color printing is not a perfect science. There are many variables that can effect the day to day quality of the digital prints. The same file, run on different days, can appear different due to the age of toner and developer. Other factors include wear and tear from many internal parts including drums and fusers. Humidity and heat can change the paper characteristics too. Even though calibrations help to minimize these job gremlins, proofing is a very important part of our process. The cost to have us make several proofs along with the time work for color correction is well worth it. The money for this service is well spent when your job warrants this. You will need to sign off on a press proof before we go into production. Using this process, our clients always walk out of the store confident that when they pick up their job, there will be no surprises. Give our Los Angeles-based print shop a call for your next digital printing job! © 2019 SLB Printing Inc.